Earlier in the year we were fans of backing Atletico Madrid to win the Champions League and we are following this trend again this week. 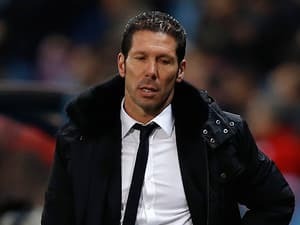 Diego Simeone is not known for allowing his teams to relax so Atletico Madrid stands out as the best midweek football bet at odds of 2.20 with Coral, to beat Porto. Atletico has made it through to the UEFA Champions League knockout phase as the Group G winner and, even when the Mattressmen did not field their strongest side against Zenit in Russia two weeks ago, they led through Adrian and they would have won had they not conceded a late own goal. Simeone’s team, which is splitting Barcelona and Real Madrid in the Spanish La Liga, won each of its first four UEFA Champions League Group G games, including a come-from-behind 2-1 victory away to Porto. Odds of 2.20 imply that Atletico is inferior to Porto when one takes home advantage out of the equation and, obviously, that is nonsense. Atletico is unlikely to put in a sub-standard performance in front of its own fans and Porto needs helping from Austria Wien to have any chance of qualifying for the last 16. If Austria Wien loses at home to Zenit, Porto will be heading for the UEFA Europa League regardless of how it fares at Atletico. Atletico has won nine home matches in a row across the UEFA Champions League and the Spanish La Liga competitions, with the Mattressmen’s aggregate winning margin over those games being 34-5. Porto lost 0-1 at Academica in the Portuguese Primeria Liga last time out and its away record in the UEFA Champions League does not support its relatively short odds. Bigger than even money about Juventus defeating Galatasaray appeals as the Italian Serie A leader tries to accompany UEFA Champions League Group B winner Real Madrid into the knockout phase. While a draw for Juventus at Galatasaray would suffice, the two-time European club champion cannot afford to play for one point on the road. The last decent side to play Galatasaray in Turkey was Real Madrid and it departed with a 6-1 victory. On lines through Real Madrid, Juventus is at least two goals superior to Galatasaray so, even allowing for home advantage, the Italian Serie A frontrunner should have too much class for its opponent. Coral is offering odds of 2.05 that Juventus, which has won eight and drawn one of its nine matches since losing 1-2 to Real Madrid in Spain – a perfectly acceptable result given that it played more than 50 minutes with 10 men – gets the better of a Galatasaray team that fluked a 2-2 draw in the reverse fixture two months ago. Juventus has improved since then and its run of five consecutive wins has featured four clean sheets. Juventus is sufficiently strong at the back to take whatever Galatasaray throws at it and its quality in forward areas is the envy of most European outfits. Similarly to Juventus, Milan needs only a draw to reach the UEFA Champions League last 16 but the Rossoneri are at home and they appear overpriced at odds of 1.67 with Coral again, to condemn Ajax to yet another sad away day. Milan is not having the greatest of Italian Serie A seasons but the Italian league is well ahead of the Dutch Eredivisie in the quality stakes and the fact that Amsterdammers could not beat the Rossoneri in the Netherlands does not bode well for the chance of an upset result in the reverse fixture. Unbeaten in its last five competitive games, Milan is not going to invite trouble by allowing Ajax to dictate terms. Ajax has to go for broke at some stage and it has not a UEFA Champions League match since beating Dinamo Zagreb 2-0 two years ago. Since Ajax’s win in Croatia it has lost four and drawn two of its half a dozen UEFA Champions League road games, losing its latest match 1-2 at Scotland’s Celtic. With regards to UEFA Champions League exotics, backing both Viktoria Plzen and CSKA Moskva to score in their Group D game in the Czech Republic gets the green light at odds of 1.67 with BetVictor. The first meeting of the teams two months ago resulted in a 3-2 home win for CSKA Moskva and, with Viktoria Plzen needing to beat its Russian opponent to enter the UEFA Europa League, a typically open match looks on the card. Viktoria Plzen has lost all five of its Group D games, while CSKA Moskva has not kept a single clean sheet.